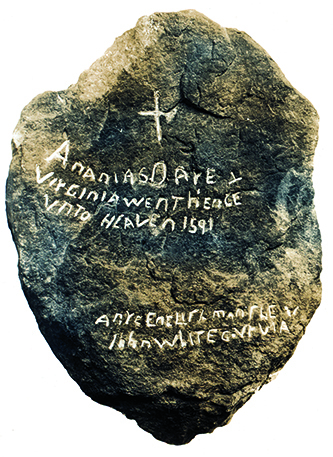 The Dare Stones are a series of forty-eight rocks chiseled with messages purporting to be those of the survivors of the famous Lost Colony of Roanoke, gone missing between 1587 and 1590. The rocks, discovered over a period from 1937 to 1940, tell a dramatic tale. For the most part, the stones have been determined to be a hoax, with the exception of the first stone discoverd. This stone, known as the Chowan River Stone, has the potential to have been inscribed during the era of the colonists. T he inscriber signed the inscription on side 2 of the stone with "EWD". These initials have been assumed to be those of Eleanor White Dare, daughter of the colony's governor John White, and mother of Virginia Dare, the first English child born in America. The inscription describes the colonists moving further inland shortly after governor John White departs for England. They suffer misery and war with the local tribes, and their numbers are reduced by illness even more until only 24 are left. After a ship is spotted, the Indians turn against them and attack, killing all but seven of the remaining 24, including her husband Ananias and her daughter Virginia. The seven remaining alive buried their dead, carved a tombstone for them, and recorded their woe in stone, and asked Governor White to handsomely reward any "salvage" (i.e., savage) who brought him the message. The Emory professors published an article in the May 1938 issue of the prestigious Journal of Southern History. Emory history professor Dr. Haywood J. Pearce, Jr. became a firm believer in the Chowan River Stone's authenticity. He persuaded his father, Dr. Haywood J. Pearce, Sr., to buy the stone from Hammond. Pearce Senior was the sole owner and operator of private school Brenau College in Gainesville, Georgia (now Brenau University), where the stones still reside. Pearce Junior led a search for the second stone mentioned in the text, but found nothing. Knowing the second stone would authenticate the first, solve its mystery, and rewrite history, the Pearces offered a $500 reward. Enter Bill Eberhardt, a stone cutter from Fulton County, Georgia. In the summer of 1939, he claimed to have found the second stone, engraved with the names of 17 deceased English colonists. He claimed to have found it near Pelzer, South Carolina and showed the Pearces the site. In fact, he said he had found thirteen stones there and provided them to the Pearces. That was only the beginning. All in all, Bill Eberhardt provided the Pearces with 42 stones, all later demed forgeries, for which he was paid a total of about $2,000. A few other stones were provided by Eberhardt's cohorts. These stones indicate the survivors journeyed southwest from the Edenton, N.C. area through South Carolina to Georgia. They go on to say that Eleanor and the six survivors found refuge with friendly Cherokees in "Hontaoase" and that Eleanor married an American Indian chief in 1593, gave birth to his daughter Agnes, and finally died in 1599 in a cave on the Chattahoochee River near present-day Atlanta. The Dare Stones had become news. Investigative reporter Boyden Sparkes published a damning exposé in the April 26, 1941 Saturday Evening Post magazine, claiming the whole thing was a hoax. Problems with the stones included anachronistic language, a consistency of spelling atypical of the time, and even hidden acrostics. The names of the colonists did not match any other existing records. 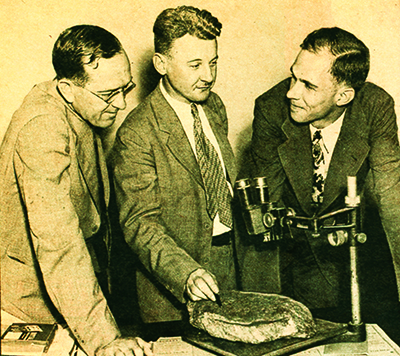 Investigating Eberhardt, Sparkes found he had sold forged Indian relics before. When Pearce confronted Eberhardt, Eberhardt tried blackmailing Pearce by forging another stone with the inscription "Pearce and Dare Historical Hoaxes. We Dare Anything." If Pearce didn't pay him $200 for it, he'd turn it over to the Saturday Evening Post and admit to faking the stones. To his credit, Pearce went to the newspapers and admitted being duped. The story topped the headlines of the May 15, 1941 Atlanta Journal. Coincidentaly, Virginia Dare and the Lost Colony were in the public eye in 1937. August 18, 1937 marked the 350th anniversary of the birth of Virginia Dare. In fact, the Fort Raleigh historic site, the state, and town of Manteo were preparing for a vist from then President Franklin Roosevelt on August 18 to mark the anniversary. On the same day, the U.S. Postal Service also released a 5-cent Virginia Dare commemorative stamp. The Fort Raleigh site had received attention during the preceding years as infrastructure developments had brought roads and bridges, at last connecting the island to the mainland of North Carolina. New Deal projects via the Works Progress Administration and the Emergency Relief Administration had helped to build reconstructions of the colonial settlement at the site. And the same year in January, North Carolina playwright Paul Green had been commissioned to dramatize the story of the colonists disappearance, penning "The Lost Colony." Green's play opened on July 4, and Roosevelt made his historic visit a little more than a month later. And in November that year, the Chowan River Stone appeared. 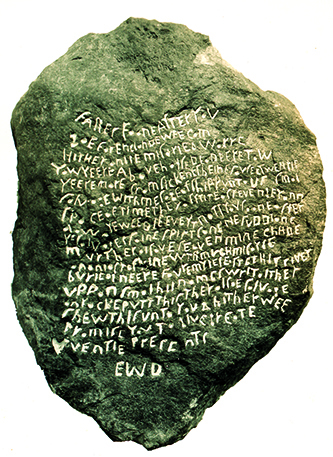 The first stone discovered, also known as the Chowan River Stone, is significantly different from the others, in the type of rock, the writing style, the usage of words, and the fact that it had nothing to do with Bill Eberhardt. If a hoax, it is a superior one requiring a level of scholarly knowledge and scientific examination that very few reputable scholars and researchers have been willing to risk their careers in an attempt to authenticate. In 2016, the president of Brenau University, a geologist by training, had samplings of the stone tested by scientists at the University of North Carolina at Asheville. A slice of the stone revealed a distinct difference between the bright interior of the rock and the darkened crevices of the engravings, suggesting to some experts that the stone may be authentic.This is based on the scientific understanding that it takes a very long time for weathering to take place and a very old inscription would have weathered significantly, as in the case of the Chowan River Stone, to a dark color along with the exterior surface. Other history and linguistic experts have disagreed, citing questions about word use and the use of the initials "EWD" (not considered a standard convention for signing one's name in the 16th century). The stone's mineral composition has also been used to target the location where it might have originated. Investigators have hypothesized that the stone came from an area in southern Virginia. Further archaeological investigation is needed to determine if the remains of settlement exist in either the area where the stone may have originated or was found. Despite these recent efforts to study and reevaluate the Chowan River Stone, it has been tarred with the same brush of "hoax" as the others and continues to remain as much a mystery as the Lost Colony itself. La Vere, David. The Lost Rocks: The Dare Stones and the Unsolved Mystery of Sir Walter Raleigh's Lost Colony. Wilmington, N.C.: Dram Tree Books. 2010. http://books.google.com/books?id=6XyW01Qg7LMC&printsec=frontcover#v=onepage&q&f=false (accessed March 15, 2013). Sparkes, Boyden, "Writ on on Rocke: Has America's First Murder Mystery Been Solved?" The Saturday Evening Post. April 26, 1941. 9-11, 118, 120-122. http://www.angelfire.com/ego/iammagi/dare_writ_on_rocke.htm (accessed March 15, 2013). Stephenson, Robert L. "Report of Observations Regarding 'The Dare Stones'." Institute of Archeology and Anthropology, University of South Carolina. April 15, 1983. "[Dare Stone number two]. Photograph. Courtesy of Brenau University, Gainesville, Ga. I was just curious. Have they tracked down any medical records for the descents of local tribes. This mystery is intriguing. If Elenore Dare may or may not have carved the stone. One of the 3 surviving men may have been her husband's journeymen stone carvers or one of the 2 boys could have been an apprentice. Has anyone search here: 36.128693, -76.659935 ? It's NE, but they probably followed the Chowan River going northeast rather than straight east. Have been so fascinated by The Roanoke Mystery. I had heard that croanoke Indians might have taken in the colonists because they were actually friendly with said colonists what do you think? They are the Chiwanoke people, associated with the Chopin River. The stone was found a mile or so up river from wher the Chowan meets Abermerle Sound, and across the sound, there is a dig going on based on the patch findings of John Whites map. Test digs ar the site of the first stone's discovery yield thousands of native and some English artifacts from the right time period. The theory now seems to be the colony split up, with half heading inland as preplanned, and some going to Croatan ( Hattaras) Island. It I my belief the first stone is genuine. It's made from stone found locally, different from the Georgia stones that are fake. The language is correct for the time period, The others not) it it correctly names colonists from records (the others do not). Plus the local native legends, the instances of blue eyes among the Chowanoke, and other anecdotal evidence. The search is currently underway for the grave stone she monotones on a small hill four miles from the stones location. The problem is the area is dense swamp now, with hurricanes changing the terrain over the years. But I believe it will be found, and will ties it all together. So, part of them went to Croatian, part went inland to the western reaches of Abermearle sound. They were most likely assimilated into the respecting host tribes of each region. I hope to return to the region next summer and talk to the local team working the Chowan River Edenton site. Do you happen to know if this dig is still continuing in 2018?